It was in 2009, when this great humanitarian whom very few people knew in urban parts of Pakistan, in those days when he was toiling hard to help our most deprived children have access to education; was awarded the Sitara-e-Pakistan. His Three Cups of Tea had already hit the shelves in 2006. Isn’t it ironic we as a nation never honour our heroes well? His name was never heard on the media. I am sure many of us didn’t even know about his momentous efforts, all without any support of Government, just using the local manpower and resources in making such a huge difference to the Northern areas of Pakistan, where schools were and still are few and far between. Young children, only a few of those whose parents are ambitious, have to walk for miles to go to a school, in adverse weather conditions, hostile environment and poor access to educational facilities. I came to know about this person when reading a review of his book, which prompted me to buy it and promote it amongst my acquaintances. He had a vision while on a descent from K2, the world’s second highest peak in the beautiful Karakoram Range in 1993. Exhausted and disoriented, after his failed attempt at conquering K2, he wandered alone without food and shelter into an impoverished Pakistani village in Northern Pakistan. He was helped and cared for like a family and that stuck to his mind forever that he was going to pay them back somehow. After being nursed back to health, on his departure he made a promise to the villagers, seeing the plight of the children. That rash promise of building a school from no resources whatsoever in a remote area, with no access to proper roads and raw material, would lead to a most incredible humanitarian effort, our country had seen. Being a nurse, working extra shifts, selling everything he owned, he tried to raise money for his dream initially with limited success, but there was a higher authority watching; such efforts never get wasted when there is a will for a good cause. Where congressmen and philanthropists failed to provide the cash needed, schoolchildren in Wisconsin showed the beacon of light by donating 623.40$.That was the incentive and there was no looking back. Help came from unexpected quarters. 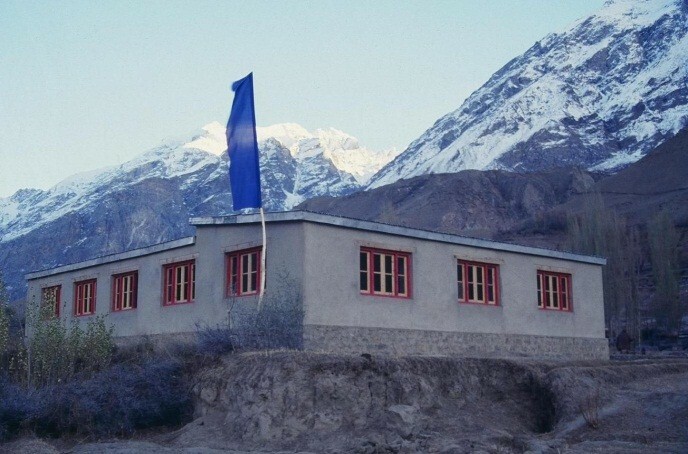 Mortenson quit his nursing job, started off to Northern Pakistan, where his love affair with the locals started in 1993 and continued for years to come, culminating in Braldu Bridge and Korphe School built solely with the help of local volunteers, who carved stone and did the construction work, with Mortenson working hand in hand with them. Khyber and Amira (his two children are testament to his closeness to the locals). Since then, he’s established 78 schools. In pursuit of his goal, Mortenson has survived an armed kidnapping, fatwas issued by enraged mullahs, repeated death threats, and wrenching separations from his wife and children. Yet his success speaks for itself. His projects have been a stupendous success not only in Pakistan but also neighbouring Afghanistan, making him a household name in the areas he has worked. He has not only build bridges quite literally, established the building blocks of the local society, making schools, hiring teachers from the community, using local volunteers for the manual work. And it all started with a cup of tea! “The first time you share tea with a Balti, you are a stranger. The second time you take tea, you are an honoured guest. The third time you share a cup of tea, you become family…” — A Balti Proverb! Mortenson’s work was greatly helped by authorities in terms of logistics, when the scale of his impact reached the higher echelons. Gen Musharraf in particular to his credit for once, the local government as well as locals were quite helpful, as acknowledged by Mortenson himself in his book, which is an inspiration. It has been a New York Times best seller and translated into at least 19 other languages. His work continues and he is still like a family member to the village where it all started in 1993 from the despair of defeat and failure. He is the co-founder of the charity Central Asia Institute; www.ikat.org, founder of Pennies for Peace and has got another best seller Stones into Schools to his credit. A journey starting off from the slopes of Mt. Kilimanjaro, following the footsteps of his parents, who were the co-founders of a local charity run Kilimanjaro Christian Medical Centre, this is a story of a lost soul in the snow-capped wilderness, finding refuge in a poor man’s quarters in Korphe, who found the biggest reason to live, leaving behind a legacy.